Playground Games plays the long game in Forza Horizon 4. What is it? An open world racing game. Multiplayer: 'Shared world' driving, with co-op and PvP events. It's autumn. The fields and fells are a rolling sea of reds, browns and yellows. Light rain falls on the screen, and the small puddles shimmer in the sunset as I drive across the windswept grasslands, skid through a wall, and drift across picturesque farmland, catching a hill at just the right angle to lift off the ground—raising my skill chain combo. It's beautiful and it's absurd, and, next week, it will all be different. Forza Horizon 4 is built around seasons. In its opening moments you drive a McLaren Senna across autumnal country roads, race a Polaris RZR across a frozen winter lake, skid through mud in a Ford Fiesta in spring, before hopping back into the Senna for a road trip on a clear summer's day. It's a montage of the series' trademark aspirational playground, here tailored to maximise the differences between its seasonal shifts. It's an emotive tour through what's to come. Once you reach the festival site, you play through each season individually across a five-hour prologue that introduces Forza Horizon 4's many different events. Had this been the game proper, it would have been enough. You complete events to build influence, hitting milestones to progress to the next season in a manner similar to unlocking new festival sites in Forza Horizon 3. But after you've completed a full loop—summer to spring—Forza Horizon 4 reveals its final form. Previously, Forza Horizon's online modes were strictly separate. Sure, you'd encounter AI representations of other players—named 'Drivatars' in the Forza series' slightly-too-corporate nomenclature—but could only play with other people if you actively chose to do so. 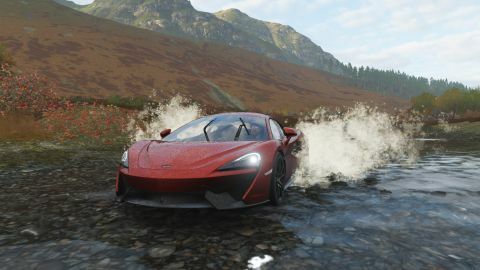 You can still play that way in Forza Horizon 4, but by default will load onto a map shared with other players. Seasons progress on a seven-day timer, and each brings specific events, and daily and weekly bounty challenges. This is Forza Horizon making its play for a regular spot in your gaming life, embracing the trend of big-budget games integrating MMO-lite systems to create an ongoing relationship—even just a small one. None of Horizon's weekly offerings feel too overbearing. It's a handful of championship races in specific car classes, an incredibly easy daily challenge (get three air skills? It'll take less than a minute), and a more involved weekly bounty that requires you to complete milestones with a particular car. But it elevates the idea of a seasonal calendar to more than just a gimmick. For the most part you and the other drivers on the map will be doing your own thing, driving between singleplayer events, hunting for rare cars hidden inside of barns, or just tearing through a field trying to build combos and (unsuccessfully) run over sheep. You can challenge other players to head-to-head races, or invite them into a convoy in order to compete in co-op or PvP events, but, unless you're actively grouped, you can't physically interact. Drive into another player and you'll pass through harmlessly—preventing would-be trolls from messing up your skill chains. It's a subtly different type of fantasy to the singleplayer sandbox, where AI racers drive recklessly to sell the festival atmosphere, but it makes the world feel alive in a different way. There's a low-level voyeuristic interest in encountering another player; to seeing what car they drive and wondering what they're up to at that particular moment. Every hour, the game attempts to cajole players into the same location with its '#FORZATHON Live' events (a name that reeks of the boardroom). These are cooperative group events in which players drive through speed traps, drift zones or danger sign jumps, banking points collaboratively with other drivers. Complete them (along with the daily and weekly bounties), and you'll earn #FORZATHON Points to be spent at the #FORZATHON Shop, where you buy rewards such as cars, clothes and emotes, which change every week. The Forzathon Live events—enough with the hashtag—are diverting at first, but never build in complexity. Building points is less about skill than numbers and endurance. None of the associated activities are entertaining enough to support a dedicated ongoing event system, which is a shame because the idea of collaborative challenges is solid, and offers one of only a few reasons to interact with other players on the map. The racing is a perfect blend of forgiving arcade handling with an obsessive attention to detail that ensures each car feels just different enough. Ultimately, the seasonal structure and shared world events are ways to keep your interest in the months ahead. But it's all built on top of yet another rich racing sandbox that easily offers tens of hours of racing, not counting the challenge events, online competition and general messing around. This time, the action takes place in a truncated version of the UK, containing bits of Oxfordshire, Cheshire, Cumbria and the city of Edinburgh, all within a few kilometres of each other. It's a similar size to Forza Horizon 3's Australia, but less vibrant. This is a predominantly rural map, full of forests, farmland and small villages, where shifts in season and weather ensure a shifting landscape of mud, ice and tarmac. On the one hand, I'm less enamoured by the setting because of how familiar it feels. As someone from the UK, these country roads will never feel as exotic as the rainforests of Australia. But there's a gentle beauty to Playground Games' depiction, particularly the northwestern side of the map, as you drive from the sweeping Cumbrian grasslands towards the steep Scottish Highlands. The seasonal structure necessitates a mostly consistent colour palette at any one time, but there's enough variety of terrain to ensure a diverse collection of race events. The racing remains peerless. It's a perfect blend of forgiving arcade handling with an obsessive attention to detail that ensures each car feels just different enough. It's not aiming to be a perfect simulation, but the weight, speed and torque of each vehicle give it a personality beyond class and category. If you're struggling with a particular race, you could turn down the difficulty (there are plenty of granular options for doing so), but often the answer is to find the specific car that favours that event. As with its predecessors, this is a gloriously silly game. As in Forza Horizon 3, the map soon becomes packed with things to do. You'll race across long, winding roads, across muddy tracks, over fields and sometimes a variety of all three—smashing up scenery to carve an erratic path between checkpoints. Outside of racing, there are multiple story events in which you're given a car and asked to complete a specific challenge. Everything, from completing challenges and race events to designing new paint jobs, tuning cars and even streaming on Mixer, has its own individual progression bar. Win street races, for instance, and you'll earn street racing influence. Earn enough to move to the next level, and you'll unlock more of that type of event, as well as other bonuses, including money, wheelspins and chat phrases to spam at other players. Even when you're not racing, you can earn rewards by driving recklessly to build up skill chains. In Forza Horizon 4, you earn skill points much faster than previous games, but here can invest them in individual cars—letting you earn bonuses when using that vehicle. It's a nice way to get some extra rewards out of your favourite cars, and more importantly ensures you're rewarded whatever you decide to do. Sure, it stings a little when a wheelspin prize lands on an ugly pair of boots for your avatar instead of a special edition car, but you always know that another chance is never far away. As with its predecessors, this is a gloriously silly game. You drive recklessly through villages, cause carnage across farmland and generally make a nuisance of yourself, all while the festival organisers and radio DJs praise you for being so amazing. You are literally given a free house within the first hour of play in what is—in today's economy—the most unrealistic thing I've ever seen in a Forza Horizon game. But while I've always been slightly at odds with the unbearably smug tone, I can't say I'm not always having fun. The best thing I can say about Forza Horizon 4 is it's worth enduring the pain of the Microsoft Store for. The best thing I can say about Forza Horizon 4 is it's worth enduring the pain of the Microsoft Store for. But where Forza Horizon 3 quickly established itself as my favourite racing game, FH4 isn't quite as noticeable a step up. It's still an incredible sandbox, with a consistently satisfying loop of fun and rewards, but its differences won't be apparent until the weeks and months to come, and the success (or not) of its seasonal event structure. What's already here is beautiful, entertaining and polished, but it's not yet clear if it can maintain the promise of the festival that never ends.